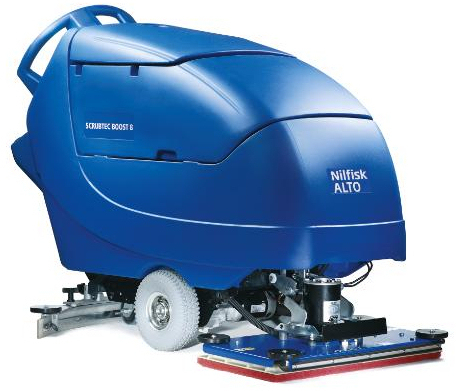 The SCRUBTEC 8 is the complete walk-behind unit for large area cleaning. More versatility, greater productivity, better reliability, extremely quiet and with advanced ergonomics. Each of the models in the range feature the latest technologies developed through our years of experience.Gimbals-mounted brushes provide adjustable pressure to ensure effective cleaning, even on heavily soiled surfaces. The parabolic AccuTrack™ squeegee leaves the floor dry and ready for re-use. The brush decks are interchangeable. The one-touch controls reduce operator error and improve cleaning results, and the ergonomics are such that operator fatigue are minimised...the list goes on! The superb performance of the SCRUBTEC 8 machines brings a new dimension to large area floor cleaning. When scrubbing and drying is this efficient, costs are optimised and the benefits become obvious. Reliable and easy to use provides added value to professional cleaning.